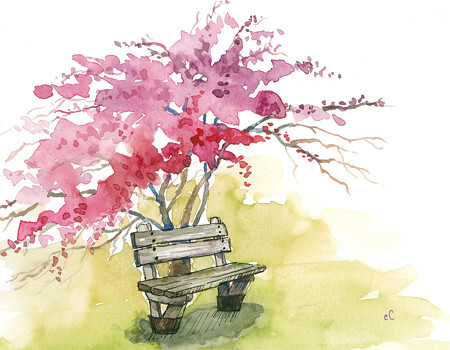 Soft Spring and Lonely Bench Watercolor – Let's Paint Nature! Wouldn’t you like to sit for a bit? Actually, I would like to sit for a while. But a storm is brewing, traveling at its storm speed. So sitting will have to wait, lonely bench. I’ll come back to you. I know where you are! This is really lovely. What a moment this captures so beautifully. Do you mind if I ask what color the pink/mauve area was that you used? I really love those shades. Thanks for sharing your work! Makes me want to go and find a bench to sit on! What a beautiful piece. I love the focused details on the bench and the bright colors of the tree against the subdued background. Yes, I’d like to sit awhile and enjoy this bench!